Keeps your skin young and blemish-free. Made From all Natural Ingredients including Tea Tree, Eucalyptus, Cardamom, Cinnamon & Carraway Oils & Turmeric. 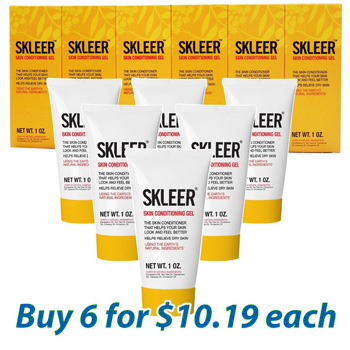 ALL IN ONE SKIN CORRECTIVE– SKLEER can be used on a number of skin problems, such as pimples & blackheads, sun & age spots, burns, cuts & grazes, pockmarks, insect stings & bites, and flaky & itchy skin. It’s also great after waxing and tattoos! 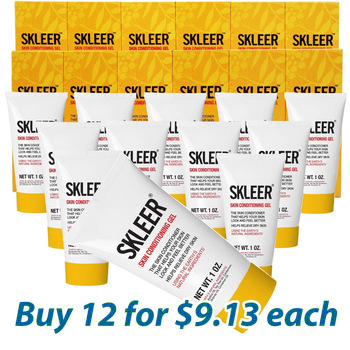 SKIN CONFIDENCE WITH ANY SKIN TYPE– SKLEER is formulated to work with all skin types, including dry, sensitive, oily, and acne-prone, as well as skin with dermatitis or eczema. MADE WITH EARTH’S NATURAL INGREDIENTS – Essential oils of Eucalyptus, Tea Tree, Cardamom, Caraway, and Cinnamon work to soothe, heal, clarify, and protect your skin. PATENT PENDING GEL FORMULA – Quick-absorbing gel draws herbal actives into the lower layers of the skin for maximum nourishment, leaving no greasy or sticky residue. 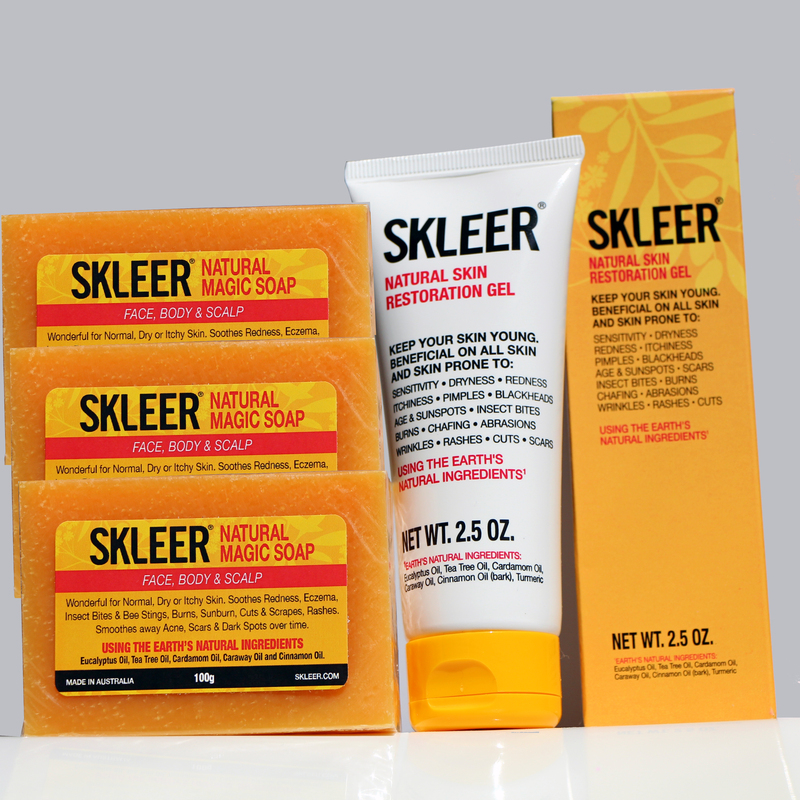 NO ADDED ACIDS OR ALKALIS; NO PARABENS; NOT TESTED ON ANIMALS – Unlike other products that make similar claims, SKLEER doesn’t contain acids or alkalis that unbalance, dry out, or damage the skin SKLEER MAGIC: SKLEER’S magic comes from the effects of its carefully chosen natural essential oils, which tone, intensely hydrate, and support the skin’s natural ability to heal. Its specially formulated gel transports these oils down into the skin’s deeper layers, where they can work their wonders. Eucalyptus Oil has anti-inflammatory, decongestant, deodorant, antiseptic, antibacterial, and stimulating qualities. It is soothing to grazes, cuts, burns, abrasions, insect bites and stings. Tea Tree Oil is a powerful antibacterial, antiviral, antifungal, antiseptic, and sudorific essential oil. It helps wounds heal quickly. It also promotes the removal of toxins, excess water, and salts from the body, while cleaning the pores. This helps prevent new blemishes from developing. Cardamom Oil is rich in vitamins such as niacin, pyridoxine, riboflavin, thiamine, vitamin A, vitamin C, and minerals. It has been used for millennia to fight infections, and cardamom oil has been shown to inhibit the growth and spread of many microbes. Caraway Oil is an antihistaminic, antiseptic, disinfectant, and tonic. It can be amazingly effective as an anti-inflammatory by neutralizing the effects of histamine. Its tonic effect helps brighten the skin. Cinnamon Oil has antifungal, antibacterial, antiviral and antiseptic properties, and is active in treating external infections. THIS ADDS UP TO: An all-in-one cosmetic for all skin types. Essential oils penetrate and deeply moisturize while supporting your skin’s innate ability to heal. Glow from the inside out with Skleer! Blown away that I can use this products for so many different skin conditions. What a winner! Best product ever! Works on eczema, dermititis, acne, insect bites, sun/age spots, burns, and just all around good for your skin, makes it look and feel good, and keeps you looking young. Love this product! So refreshing. Won’t leave home without it.